Henry had previously served with the 12th Royal Lancers. He enlisted into the R.A.M.C. on 11th August 1914. He was 39 years and 4 days old at the time, and was a cook by trade. He specially enlisted as a cook for the duration on the war. He entered the war in France on 29th August 1914. By 19th March 1915 though, Henry was complaining he had a cough and couldn't get his breath. He was invalided back and sent to the 2nd Northern General Hospital. 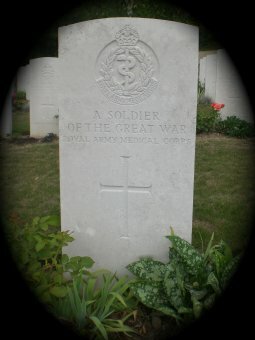 He was discharged "No longer physically fit for war service" on 3rd July 1915. He was the son of Henry and Emily Iles of 19 Lewin Street, Redfield, Bristol.